I love shrimp. I could eat shrimp every day. And it's hard for me to imagine any way of cooking and serving shrimp that would be unappetizing. I came upon this photo and recipe for Shrimp and Cauliflower in the 1971 Betty Crocker Recipe Card Library. Who would smother all those wonderful shrimp in a white sauce and then serve them with cauliflower and -- blech! -- peas? This whole thing is seriously depressing and easily qualifies as a Halloween ephemera horror in my book. 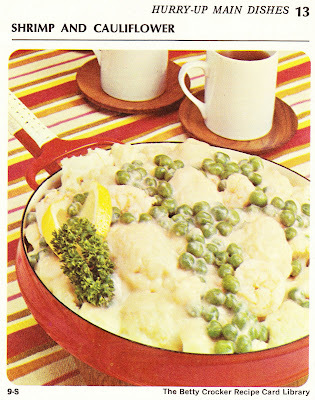 Cook cauliflower and peas in ½ to 1 inch boiling salted water just until tender, 3 to 5 minutes; drain. In saucepan, heat milk, soup, salt and pepper over low heat, stirring constantly. Stir in cauliflower, peas and shrimp; heat through. If you wish, garnish with toasted almonds. 3 or 4 servings. Without the white sauce, this wouldn't be bad. Needs some garlic, though. Tim's right. It needs garlic and olive oil and maybe some crushed red pepper flakes. Throw out everything except the shrimp and add some wine and linguini. There all fixed. You're welcome!